Found only because it was fleeing raiding driver ants. Iten, Kenya, Dec. 2015. Length is about 5mm. Among the many phyla, classes, families and species that inhabit the soil and leaf litter in a forest ecosystem are the Isopoda, a class of Crustaceans. Crustaceans include the crabs and shrimp that inhabit the oceans, and indeed very few have made the transition to terrestrial life. 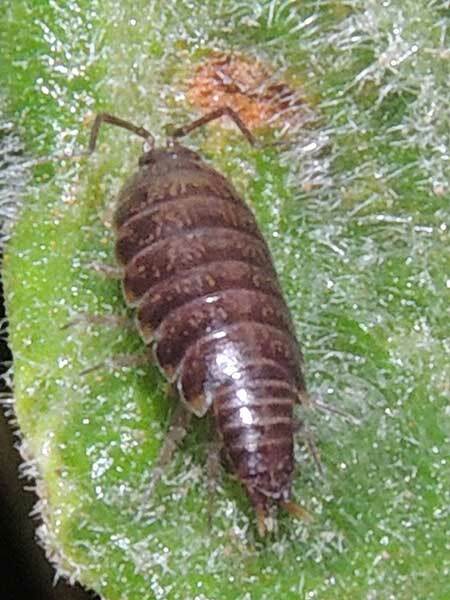 Isopods are commonly called pill bugs or woodlice. Their food is primarily detritus - the decomposing remains of plants and animals that have accumulated in and on the soil. The specimen photographed here was driven from that habitat by marauding driver ants.